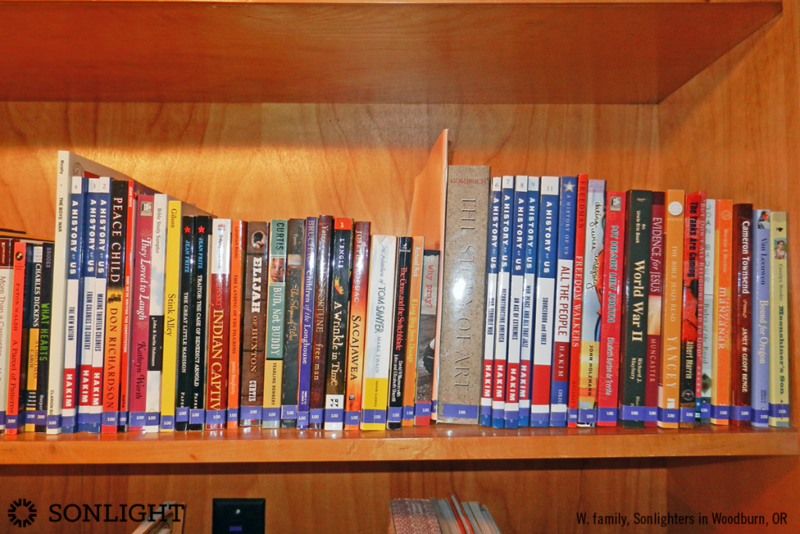 I read this article and wanted to share it with you: So Many Books: How to Organize Your Homeschool Library https://blog.sonlight.com/books-organizing-homeschool-library.html. 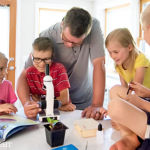 Whether you have just one Sonlight package in your home or—like our family does—multiple years’ worth, it won’t take long to realize that organizing your school books is essential. There’s no one right way to get the job done, and I’ve heard a myriad of methods in our thirteen years using Sonlight. The key is to find a system that works well for your family, one that that allows you to easily find the books you need when they’re scheduled in your Instructor's Guide (IG). Space—The amount of room you have available for books determines how many you keep and where they’ll go. Convenience— All students and adults need to easily access books, while possibly making them inaccessible to very young children and/or pets. Appearance—Books are kept in an orderly manner that doesn’t create a cluttered feeling in the room or are incorporated into the home’s décor by use of specific furniture or accessories. For many years we had shelf space only for the current year’s books. The books one child had finished and the next child wasn’t ready for went in clear totes that were stored in closets or garages. I labeled each box with what History / Bible / Literature, Science, or Language Arts program was stored inside. During our years of homeschooling, we’ve lived in three homes and had a different way of handling books in each one. 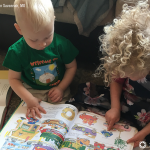 Convenience and independence are important to us, so the primary goal has always been that each child could easily get and put away their own books. In the beginning, current books and IGs were kept on a bookshelf in our oldest kids’ bedroom and unused ones were stored in a detached garage. In our next home, the current year’s books were on shelves in the living room, current IGs were left open in a row along one side of our hallway, and each week’s books were stacked next to the corresponding IG. The curriculum we weren’t using was packed away in the upper shelves of a bedroom closet. We currently keep all books on the floor to ceiling shelf I mentioned earlier, upper level packages on the top, and lower level on the bottom. 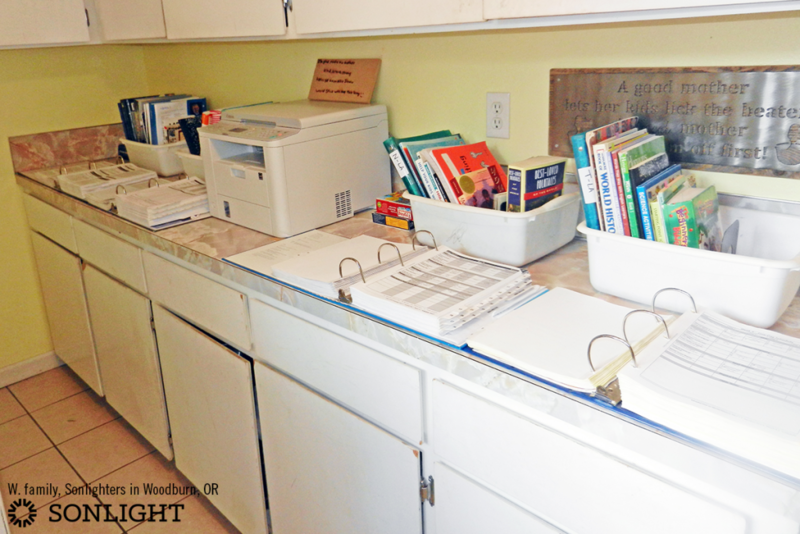 A long counter in our laundry room is where we leave current IGs open and have a small bin for each child’s books they need that week. While the other factors are pretty straight-forward and objective, arranging books is where personal preferences come into play. 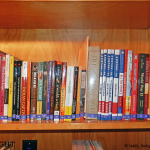 I’ve known people who shelve books according to subject (Readers, Read-Alouds, History, etc. ), while others prefer to organize by title or author’s name. In each of those cases, some apply their method to each Sonlight program individually and others combine their packages on their shelves. Some put all the books from one package together, but don’t worry about the specific order they’re in. The method that works best for our family is grouping books by package, and then lining them up in descending height order. When the first book gets finished, it goes to the left of the tallest unread book, beginning what will become a row of completed books in descending height before the row of books waiting to be opened. This satisfies my desire for things to look orderly and allows kids too young to alphabetize to put books away. Separating read and unread books makes it easier for kids to find the next book their IG calls for and gives tangible representation of the progress they’re making throughout the year. 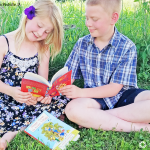 Over time, it’s also proven to be a good way for older kids to describe specific books to their younger siblings—“It’s about this tall, really thin, and has a blue cover.” These kinds of explanations seem to be incredibly effective for finding books. 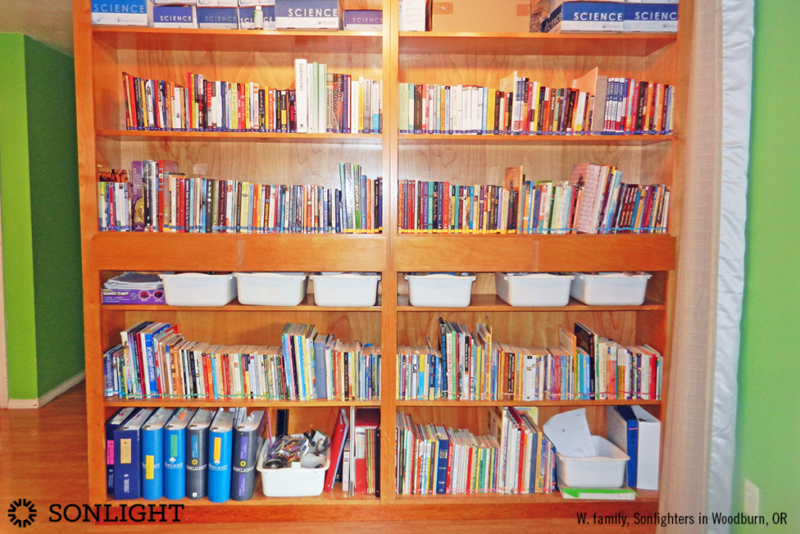 Whatever approach you take to organizing all your books, using Sonlight’s book labels will simplify things immensely. 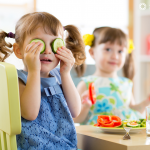 Once your books are organized in a way that makes sense for your family, you’ll find your school days run more smoothly. Just be prepared to adjust your book organization plan as you accommodate new living situations or changing family dynamics! 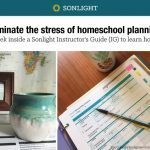 If you love an organized homeschool, you'll love Sonlight. 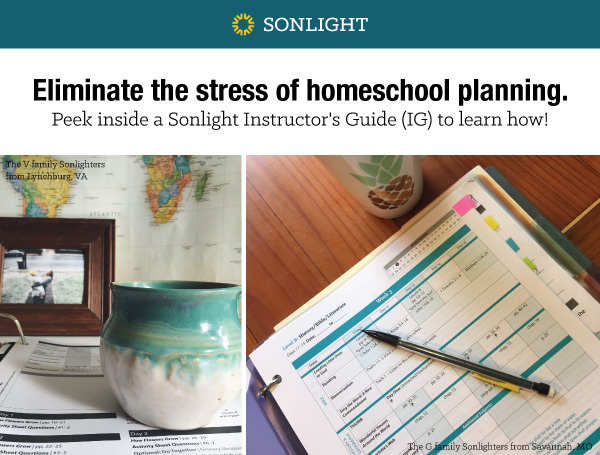 Your Instructor's Guides are like a personal homeschool mentor who plans and organizes your entire homeschool year. See more and get IG samples here.